In this section you will find a great range of showers to the pool and garden. Between and including yours. Verify the reconfortante that can be to take a shower without the cold water causes an abrupt change to us of temperature. Our garden and pool showers are committed to design and quality, endowed with true identity and different styles. You can view and choose from a wide variety of pool showers of different types and materials In this category. Solar shower for pool and gardens Happy Five 28 liters. Many colors to choose. Made of high density polyethylene. Solar shower for pool from and gardens Happy 25 liters. Many colors to choose. Made of high density polyethylene. Solar shower of PVC with 9 liters of capacity of deposit. An economical shower and very functional to have hot water. Solar shower of 20L of the brand Gre 40664A. Made of black PVC. With single lever faucet and adjustable spray. Big Happy solar shower for pool and gardens 40 liter capacity. Many colors to choose. High density PVC. Jolly aluminum solar shower for swimming pools and gardens 25 liters. Hot water for your shower no cost. Solar showers with wooden look of different capacities and designs. Practicality and decoration in a single product. Happy Go Solar shower 23 liter. Made of differents colors polypropylene with 1,19 m high. The best for your feet. Solar shower for pool and gardens Happy Five 28 liters white color made of high density polyethylene. Solar shower for pool and gardens Happy Five 28 liters white color with footwasher made of high density polyethylene. Solar shower for pool and gardens Happy Five 28 liters blue color made of high density polyethylene. Solar shower for pool and gardens Happy Five 28 liters blue color with footwasher made of high density polyethylene. Solar shower for pool and gardens Happy Five 28 liters orange color made of high density polyethylene. Solar shower for pool and gardens Happy Five 28 liters orange color with footwasher made of high density polyethylene. Solar shower for pool and gardens Happy Five 28 liters pink color made of high density polyethylene. Solar shower for pool and gardens Happy Five 28 liters pink color with footwasher made of high density polyethylene. 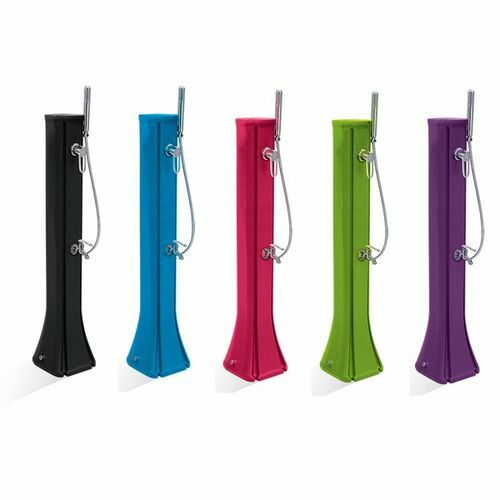 Solar shower for pool and gardens Happy Five 28 liters purple color made of high density polyethylene. Solar shower for pool and gardens Happy Five 28 liters purple color with footwasher made of high density polyethylene. Solar shower for pool and gardens Happy Five 28 liters black color made of high density polyethylene. Solar shower for pool and gardens Happy Five 28 liters black color with footwasher made of high density polyethylene. Solar shower for pool and gardens Happy Five 28 liters green color made of high density polyethylene. Solar shower for pool and gardens Happy Five 28 liters green color with footwasher made of high density polyethylene. Solar shower for pool and gardens Happy Five 28 liters red color made of high density polyethylene. Solar shower for pool and gardens Happy Five 28 liters red color with footwasher made of high density polyethylene. Big Happy blue solar shower for pool and gardens 40 liter capacity. Made in high dessity PVC. Big Happy blue solar shower with footwasher for pool and gardens 40 liter capacity. Made in high density PVC. Big Happy white solar shower for pool and gardens 40 liter capacity. Made in high density PVC. Big Happy white solar shower with footwasher for pool and gardens 40 liter capacity. Made in high density PVC. Big Happy purple solar shower for pool and gardens 40 liter capacity. Made in high density PVC. 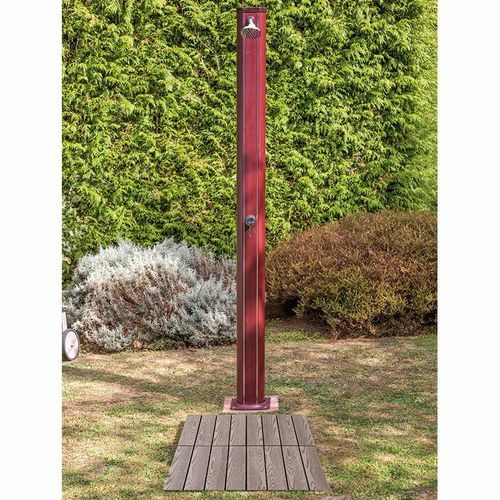 Big Happy morada solar shower with footwasher for pool and gardens 40 liter capacity. Made in high density PVC. Big Happy orange solar shower for pool and gardens 40 liter capacity. Made in high density PVC. Big Happy orange solar shower with footwasher for pool and gardens 40 liter capacity. Made in high density PVC. Big Happy solar shower for pool and gardens 40 liter capacity made in color black or anthracite. Big Happy black solar shower with footwasher for pool and gardens 40 liter capacity. Made in high density PVC. Big Happy pink solar shower for pool and gardens 40 liter capacity. Made in high density PVC. Big Happy pink solar shower with footwasher for pool and gardens 40 liter capacity. Made in high density PVC. Big Happy red solar shower for pool and gardens 40 liter capacity. Made in high density PVC. Big Happy red solar shower with footwasher for pool and gardens 40 liter capacity. Made in high density PVC. Big Happy green solar shower for pool and gardens 40 liter capacity. Made in high density PVC. Big Happy green solar shower with footwasher for pool and gardens 40 liter capacity. Made in high density PVC. Solar shower Jolly blue color for swimming pools and gardens 25 liters without footwasher. Solar shower Jolly blue color for swimming pools and gardens 25 liters made in aluminium with footwasher.